About six months after I visited Barnfield, and coming up to the summer, I visited Wargrave Big Local, in Newton-Le-Willows, close to Warrington and St Helens. Wargrave is a fascinating area, defined by its history as a place built to house workers at the Vulcan Foundry. From 1832 to 1962 the Vulcan works built many of the locomotives that hauled trains across both Britain and the world. "Fifty-five years after the original Vulcan Works shut its gates, Wargrave continues to suffer from poor public transport and a lack of local services." Whilst the industrial site on which it was based maintained some productive activity by building diesel engines up until the late 1990s, what was once a hive of economic activity and employment is now the 600-home ‘Vulcan Village’, providing accommodation to affluent Cheshire commuters. It’s a far cry from the time when the same place employed the workers who were building the engines that powered the nation. If you don’t live in a community like Newton-le-Willows, or similar places built on a single industry - this is a story that could equally apply to the many former mining communities in the Big Local programme - it is hard to understand the impact change on that scale can have, and for how long. When, for over a century, the notion of community was indivisible between workplace and home, turning into a commuter suburb for somewhere else isn’t easy. Social structures take time to adapt. So does wider infrastructure. Not much bar raw materials and finished machines came in and out of Wargrave for 130 years, and there wasn’t much of a need for public transport links when your workforce lived on the doorstep, or for public services when nearly all could be delivered in the workplace. Fifty-five years after the original Vulcan Works shut its gates, Wargrave continues to suffer from poor public transport and a lack of local services. "For me, Wargrave demonstrated – more than anything – the way in which Big Local has been able to provide some communities with not just a seat at the table, but the ability to set local agendas." It’s a challenge that the Wargrave Big Local were absolutely focused on tackling. Meeting an impressive array of Big Local partnership members, residents and local stakeholders at the Newton Community Centre, I was taken through their plans to tackle underlying problems in their area by Louise Forshaw - an ambitious and driven partnership chair. It was immediately clear that alongside plans to tackle community safety, health, employment, environmental and financial inclusion issues in the area was a wider priority around connecting Wargrave – physically, organisationally and economically – to a much wider community. For me, Wargrave demonstrated – more than anything – the way in which Big Local has been able to provide some communities with not just a seat at the table, but the ability to set local agendas - something hinted at by David Boyle in his reflections on the Arches Big Local as part of his essay The Grammar of Change. 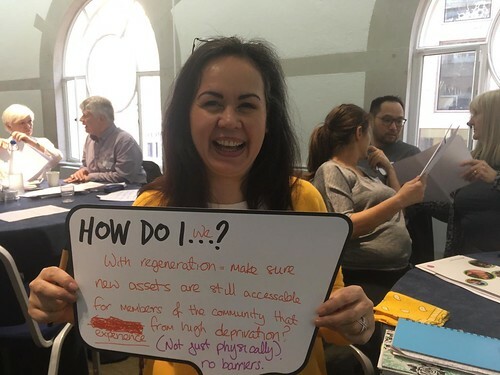 With key partners around the table – from Torus, the local social landlord, to the council, health agencies, job centre and local social entrepreneurs – the Big Local partnership was providing a space with the community at the centre of setting priorities and delivering solutions. Like Barnfield, community action didn’t start with Big Local – the Newton Community Centre had been saved from closure due to a funding shortage prior to Big Local, when a large group of residents joined forces to raise the shortfall. The difference was Big Local had helped take that energy and local self-belief, and provide the opportunity to deliver real change.